METRICS: Measure the potential gain leading to the economic benefit of your solution vs. competition. ECONOMIC BUYER : Identify and meet the person who has the ultimate word to release funds to purchase. DECISION PROCESS: Know and Influence the process defined by the client to make purchase decision. DECISION CRITERIA: Know and Influence the criteria defined by the client to make purchase decision. IDENTIFY PAIN: Identify and Analyze the pains which require your solution to be relieved. CHAMPION : Identify, Qualify, Develop and Test your Champion or your Internal Seller. In a nutshell, MEDDIC tells you that if you do the above in any complex B-to-B sales campaign, you win the sale. Metrics are, by definition, a comparative measure of benefits, obviously compared to the competition (which could be the incumbent system or the non-decision). Metrics forces the seller to consider competition. 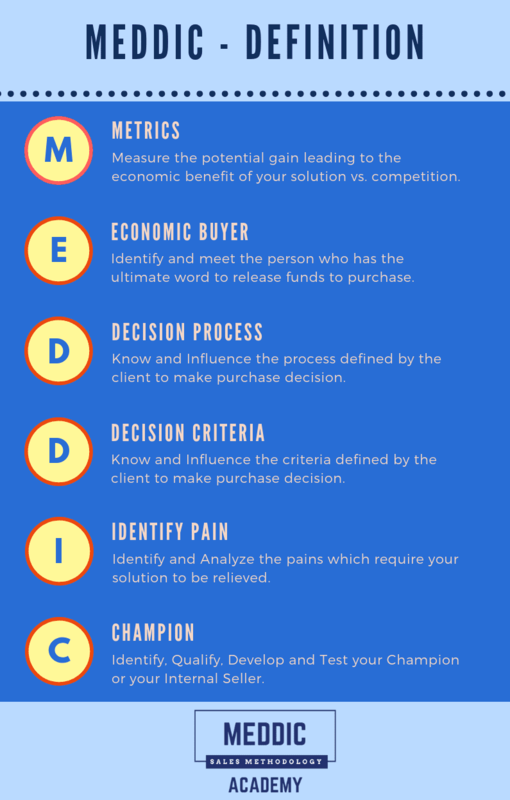 During MEDDIC courses, one of the key concepts you learn is how to link a set of decision criteria to a vendor, whether it’s one of your competitors or your company. Decision Criteria is also another element forcing sellers to consider competition. To make it even more complicated, some people have added a P, representing the “Paper Process”, thus creating yet another variant of MEDDIC, called MEDDPICC. They are right to emphasize that the paperwork, and the interactions with legal department or purchasing could be a nightmare. These issues take time to resolve, often leading to a delay in the purchase order. It is absolutely necessary for the Account Executive to understand the “paper process” and anticipate the issues. For instance you can avoid those issues by sharing your company’s standard contract or TOS earlier in the process. That said, the “paper process” is still part of the decision process. Technical approval process, business approval process, legal approval process, are all part of the decision process. Moreover, for the purpose of learning, a common language, we stick to the original MEDDIC. Where does MEDDIC come from? MEDDIC is the result of the Sales and Qualification techniques developed at PTC (aka Parametric Technology Corp.). PTC is a software company known for having built one of the strongest sales cultures in the context of Enterprise Software (now SaaS). The company had over 40 quarters of continuous growth during the 90s. The initial Global Sales Management team at PTC developed different elements of MEDDIC in the field. Later, PTC training managers at the headquarters in Boston leveraged the best practices in the field. They put them together in a formal practice course for new hires and gave it a name. MEDDIC Academy’s founder, Darius Lahoutifard, was a member of that initial international sales leadership team at PTC. He took PTC Southern Europe from $4M to $27M in 3 years, beating the main competitor (which was and still is Dassault Sytemes) in their own fiefdom (Dassault is a French company). Darius naturally contributed to the elaboration of MEDDIC and showed example of execution. He later practiced it in his career including his sales leadership roles at THINK3 and Agile/Oracle among other companies. Liked what you just read? Feel free to share it (see share buttons right below).